This guide was produced by the CEC in partnership with the Canadian Liver Foundation. It serves as a resource for community care, healthcare, and social service providers to help promote a greater awareness about hepatitis C in ethnocultural communities. The hope is that healthcare providers will continually build on and adapt the content of this guide to meet the needs of Canada’s diverse population.cy of Canada. 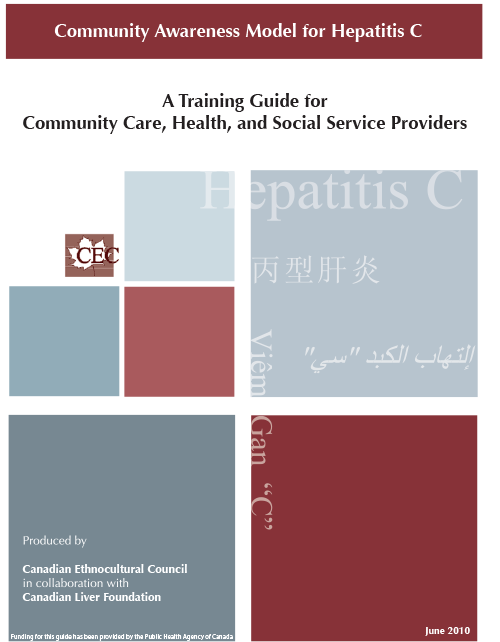 This training manual for healthcare and community care providers was produced in partnership with the Canadian Liver Foundation, and with funding from the Public Health Agency of Canada. 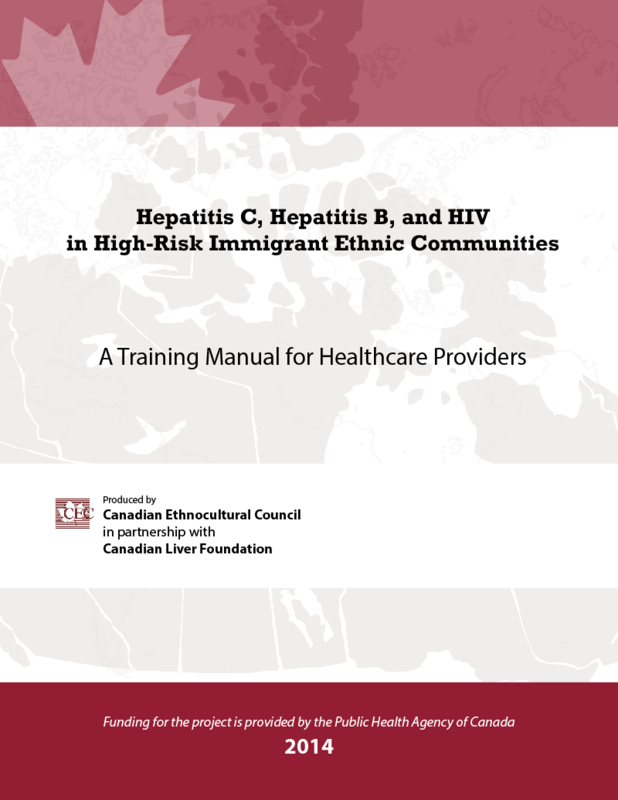 It serves to promote greater awareness and cultural-sensitivity on the part of the professionals about hepatitis C, hepatitis B, and HIV in high-risk immigrant ethnic communities. Although these three illnesses are prevalent in many such communities, the five communities that have been selected for this project are: Chinese, East Indian, Egyptian, Filipino, and Vietnamese. The hope is that healthcare providers will continually build on and adapt the content of this guide to meet the needs of Canada’s diverse population. This presentation was developed in partnership with the Canadian Liver Foundation. It can be used by anyone wishing to give a workshop on hepatitis C, hepatitis B, and HIV, focusing on means of transmission, prevention, and treatment. The content can be adapted according to audience. Slides are featured for the five immigrant ethnic communities selected for the project: Chinese, Egyptian, Filipino, South Asian (East Indian), and Vietnamese. These five fact sheets were created in partnership with the Canadian Liver Foundation for use by healthcare and community care professionals as well as members of the five ethnic communities selected for the “Hepatitis C and Other Related Communicable Diseases in High-Risk Immigrant Ethnic Communities” project: Chinese, East Indian, Egyptian, Filipino, and Vietnamese. They contain information about hepatitis C, hepatitis B, and HIV, prevalence rates in home countries, and some demographic information about the communities. They are available in the community languages (Arabic, Simplified and Traditional Chinese, Punjabi, Tamil, Tagalog, and Vietnamese). Please check the Resources for Ethnic Communities section of this website. This is a training and resource guide for healthcare, community care, and social service workers. 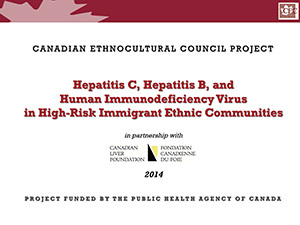 A Report prepared by the Canadian Liver Foundation and the Canadian Ethnocultural Council. March 2009. This card was designed in partnership with the Canadian Liver Foundation as an educational tool and quick reference about hepatitis C. The focus is on risk factors, symptoms, treatment, and prevention. Prepared by the Canadian Ethnocultural Council. Funding provided by the Public Health Agency of Canada. Disclaimer: The content in this Section including but not limited to text, graphics, images, and information, etc. (“Content”) was created by Canadian Ethnocultural Council (CEC). The Content is for informational and educational purposes only, and is not intended to be a substitute for professional medical advice, diagnosis, or treatment of any kind. Yee Hong Centre for Geriatric Care makes no representations or warranties of any kind, express or implied, about the completeness, accuracy, reliability, suitability or availability of the information, products, services, or related graphics contained in this Section, including the publication, the links, the announcements and/or other materials, etc. under this Section for any purpose. Any reliance you place on such information is therefore strictly at your own risk. Yee Hong will not be liable for any losses and damages in connection with the Content.